OVER HERE, the obscene attack has been regarded mainly from the standpoint of the global campaign for the education of girls. Malala Yousafzai is an eloquent and renowned advocate for girls’ schools. About the necessity and the nobility of her cause there can be no doubt. After all, she scared the Taliban. And it is not too much of an exaggeration to say, as Nicholas Kristof did in The New York Times, that “the global struggle for gender equality is the paramount moral struggle of this century, equivalent to the campaigns against slavery in the 19th century and against totalitarianism in the 20th century.” Except that, in places such as Pakistan, and Afghanistan, and Mali, and Yemen, and elsewhere, the struggle for gender equality is the campaign against totalitarianism. Pardon the heresy, but the twentieth century is not dead. This is not an academic point. The goodbyeto-all-that fantasy about the horrors of the last century—the merry conferencebuilding certainty that we have transcended ideological conflict for a meliorating world of best practices— impedes a proper understanding of what many good people in many bad places now confront. They are not yet post-historical. The attempt on Malala Yousafzai’s life was not the expression of a problem, it was the expression of an evil. There are circumstances in which the term “evil” is not moralistic, but analytical. Too much of the discussion of the world’s ills is conducted in the upbeat problem-solving vocabulary of the Philanthropy International, which, like the unaccountably cheerful Kristof, is forever edified by tales of local braveries and by the magnitude of its own compassion. In his column on Malala Yousafzai, for example, Kristof writes: “For those wanting to honor Malala’s courage, there are excellent organizations building schools in Pakistan, such as Developments in Literacy (dil.org) and The Citizens Foundation (tcfusa.org).” I am sure that those enterprises are fully as worthy of support as Kristof says they are. A call to charity is never wrong. But there is something facile, emotionally and strategically, about the trend in good works. A few months ago, the Pakistani newspaper Dawn reported that 710 schools have been destroyed or damaged by Islamic militants in Khyber Pakhtunkhwa and 401 schools have been destroyed or damaged in Swat. Such violence, and its wildly misogynistic dimension, is precisely what Malala Yousafzai was defying; but it will not be defeated by charity. The war against schools is not just a war against schools. “IF ANYONE THINKS that Malala was targeted because of education,” declared the Taliban, in a statement cited by Dawn, “that is absolutely wrong, and propaganda of media. Malala was targeted because of her pioneer role in preaching secularism and so called enlightened moderation.” Those are the classical stakes of all modernization struggles. If you believe that democracy is light and theocracy is darkness, then this is a war between light and darkness. Which is to say, a political war, a war over power. While steady and serious reform—educational, cultural, social— is required to secure and to expand the gains of liberalization, these reforms cannot proceed without the protections of politics, of government. It takes time to educate schoolchildren, to impart knowledge and toleration; but it takes no time to shoot schoolchildren. The earliest stirrings of enlightenment are always the most vulnerable, and without the endorsement, and the assistance, of the state, and the legitimate use of its force against terrorists, they will be cut down. Civil society is not the answer; it is the arena. A debate about the correct interpretation of shariah is not the solution, because shariah itself, its political prominence, its claim to perfect authority, is the problem: you cannot break the grip of religion by remaining within its universe. The program of the Taliban is political, and it can be met effectively only by another politics. 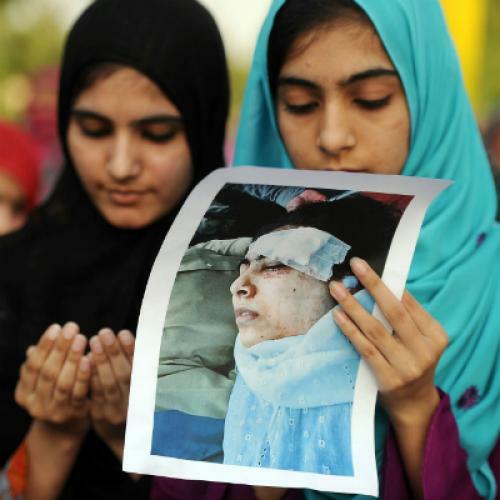 The attack on Malala Yousafzai was a political failure: of the callowness and the corruption of Pakistan’s government, and of its insane system of dual power, in which the army and the intelligence services collude with the medieval butchers, who do not dream of peace. The shooting on the schoolbus in Swat should disabuse Westerners eager to quit the struggle of their illusion that we may quit because we won; and also Pakistani and Afghan politicians (notably the dashing and counterfeit Imran Khan, and what Pankaj Mishra moistly calls “his quest for a moral Pakistani state and a righteous politics”) of their nonsense that the Taliban will agree to live and let live. Our triumphalism about terrorism is premature. The revolutionary turbulence in the Arab world has given even Al Qaeda new openings. Bin Laden is dead. Bin Ladenism is not. In some places it is almost as alive as General Motors.